Human constructed lines within the natural landscape are developed to separate places, things and ideals. The essence of nature is lost in this realm of fragmentation where individuals believe they benefit from partitioning of land, while nature is broken up from original compositions created through long bouts of space and time. Land acquisition depends on a concept that states a parcel or plot of nature exists for purpose of claim. Inasmuch,nature is an impossible sale-point and portrays overarching enslavement of land. Nature is essentially chaos, depending on values beyond the scope of economy and capitalization while surpassing spurts of materiality and human destruction that tries to hold it hostage. Nature is only contained by nature, not by human regulation, as man would prefer. Boundaries are arbitrary as they ultimately signify division of being and existence rather than pronouncing universality by nature. 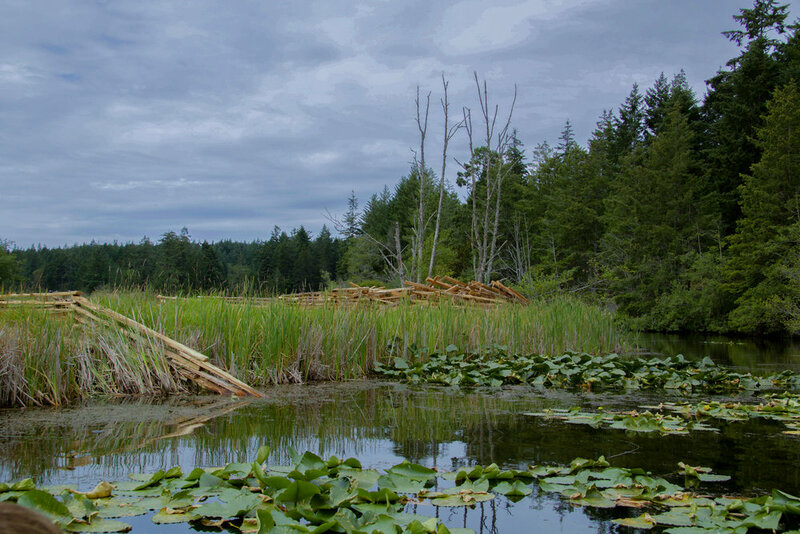 The work “Embark/Embrace” begins as a red cedar log felled on its side at the edge of a large body of water. 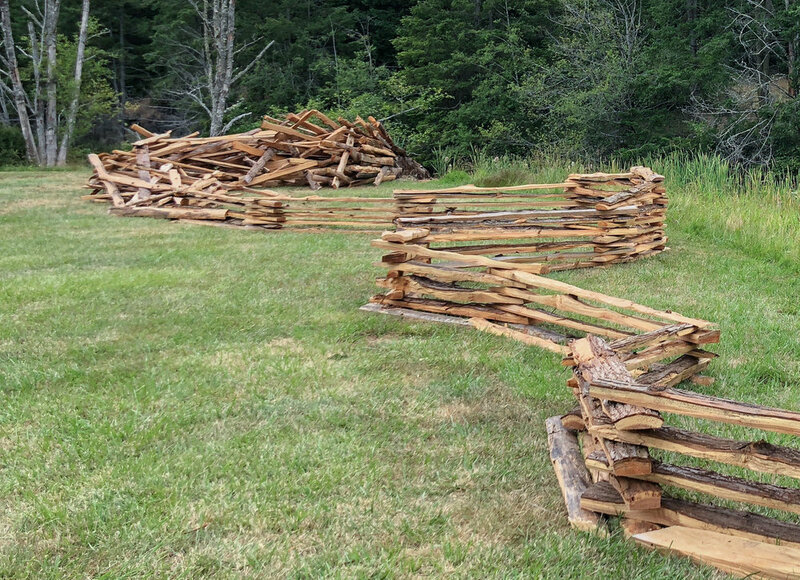 As it extends out from the water, it explodes into large splintering shards of wood that eventually form into a split rail fence, meandering and arbitrarily dividing land, and water. Temporary transformation of red cedar log into a fence will ultimately make its return to nature over time. Red Cedar is a beneficial habitat for many native creatures, represented by bronze sculptures of salamanders, toads, voles, snails, snakes, turtles and beetles. 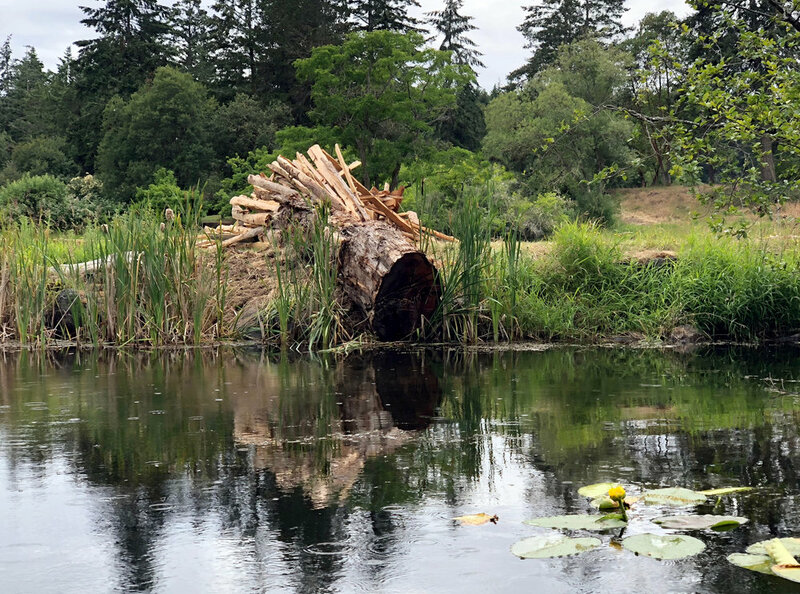 The small creatures dot the sculptural installation like a treasure hunt where guests can connect with the native ecosystem found there. Mushrooms are integral to the forest and the intricate food web found there. Fungus creates beneficial root associations with host plants to exchange nutrients, and is a major food source for many small mammals. Many mushrooms form symbiotic relationships with the root systems of shrubs and trees to access essential carbon and sugars. Fungus as a detritivore enables trees and plants to absorb valuable phosphorus, nitrogen, and water from the soil in a recycling of their own waste and byproducts. Both trees and mushrooms are among the longest living plant species found on Earth. Join the artists by “planting/growing” mushroom-shaped cookies of Red Alder along the split rail Red Cedar fence as an interactive way to build onto the sculptural installation. Holes are pre-drilled in split-rail lengths along the bottom of the fence, ready to accept wooden dowels. Guests are invited to embellish the "mushroom cookies" in the Lakedale activity tent and then place them into the sculpture in family/friend groupings with the dowels, further reinforcing the integrative nature of the piece.